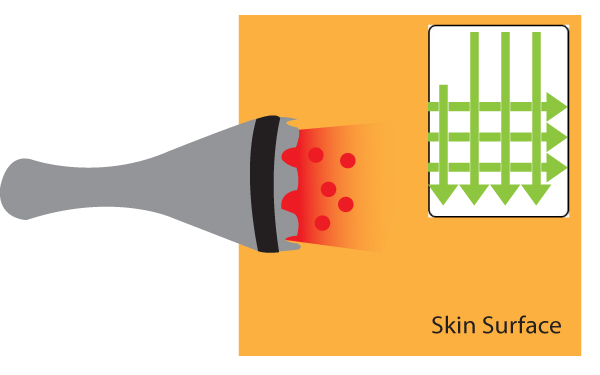 LiteCure lasers are not designed for spot treatment. Instead the treatment area is larger than the beam area and the PBM treatment is delivered by scanning the treatment head over the treatment area in a continuous movement (watch the 10 second video to see the scanning technique below). Treatment with LiteCure lasers is non-invasive and it is not possible to measure the dose delivered to the target tissue; it is only possible to measure the dose delivered to the treatment area. However, we do know from cadaver, animal studies and modelling that the absorption of the laser in the skin and fat layers on its way to the target tissue can significantly reduce the dose that gets to the target tissue. 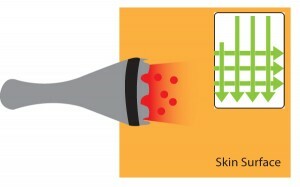 The most prevalent method of indicating laser therapy dosage is to measure the density of energy applied to the tissue surface. This is typically expressed in J/cm2. Some variation in clinical effects can be observed; particularly at very high (>50W) or very low (<1 W) power settings using the same J/cm2 dose. The measurement technique works well for typical treatment protocols, but is not absolutely ideal. LiteCure provides a treatment guide with each device with recommended dosing for different clinical conditions.